When I worked in the United Arab Emirates, from 2000 to 2004, I came across Bill Davies. Bill has lived in the UAE for many years and is, like me, interested in the aviation history of the region. In early January 2007 he rediscovered the remains of a crashed Vickers Vincent, dating from 1937, at Khor Gharim on the coast of Oman (see Colin Richardson’s 2003 book on “Masirah”, pages 63-77). We arrived back late last night after spending six nights camping in Oman, three of them at Khor Gharim. Armed with the map and pictures from Colin Richardson’s book plus a metal detector, Kate (my wife), our friend Roy Richards and myself set off to hunt for the Vincent. The map showed the crash site as being directly opposite an inlet in the Khor but despite a quite intensive search nothing was found here. We then decided to explore the edge of the Khor further to the north, bingo Kate got a large hit with the metal detector. What she had discovered was the engine, the upper part of which was about six inches under the surface. We started digging but it soon became obvious that what remained was extremely corroded. The aluminium cylinder heads had completed disappeared into a white mush and the cylinder block though mainly intact was almost fused with the surrounding sand. However we managed to clear the sand from around two of the nine cylinders, enough to identify it. I brought back a few ‘lumps’ which I think were attached to the cylinder head, once I have them cleaned up I should be able to identify individual components. Bill knew of my article with Peter Hellyer on the crash of an RAF Wellington bomber in 1943 on the Fujairah coast of (what is now) the UAE (Tribulus 2006 15 ) and informed Tony Tubbenhauer, a former World War 2 RAAF pilot, now peacefully retired in Australia, with whom he was in contact. Tony had been based in Sharjah during the war, and had even flown the Vincent. He was also flying Blenheims and Bisleys from Sharjah, and might even have been one of those who searched for the missing Wellington. It turned out he was not involved in that search, although was in others. I scanned and e-mailed that piece you and Peter Hellyer had published in Tribulus awhile back about the Wellington bomber to Tony in Australia as I thought he may have had some first hand knowledge. It turns out he left Sharjah in late December 1942, it was worth a try! Obviously he has got your e-mail address from the article. I’m glad he has been in contact with you, as you will find him an absolute encyclopaedia. I think he is now 86 and is as sharp as they come, having recently mastered the internet, e-mail and his new digital camera. How many half his age can say that? Tony was obviously interested in our article, and soon began to realise that I was very interested in his own fantastic story, and we have remained in almost daily contact by e-mail since. but I think it eminently worthwhile adding a little more. Tony Tubbenhauer was born in 1921, a (quote) “country lad, son of impoverished ex-WW1 farming parents. I always wanted to fly. Good old Adolf gave me the chance”. He was accepted for aircrew duties and joined 8 Course, RAAF, at Bradfield Camp, Sydney, in November 1940. He then progressed to Ansons at 3 Service Flying Training School at Amberley, Queensland, as a newly fledged Pilot Officer. He served with the RAF during World War 2 when he flew 18 different types of aircraft and did 77 operational flights on two squadrons, 244 (Blenheims at Sharjah from April to December 1942) and 203 (Baltimores at Benghazi, 1943) in his tour of duty in the Middle East and Africa. The next month he left with Gordon, his navigator, and Bill, the air gunner, for Iraq. While waiting for some Blenheim IVs to be made more or less airworthy for 244 Squadron, he was pressed into service to fly a variety of ancient aircraft with the Communications Flight at Habbaniya near Baghdad in 1942. This Valentia (K3599) was at Habbaniya, near Bagdhad. Tony flew it to Cairo and around Iraq. In April 1942 Tony set off in a Blenheim IV, with two others, to Sharjah on the Persian Gulf to join 244 Squadron. He stayed there until December, hating the place for its extreme discomfort. December 1942 found him in a Hudson on his way to join 203 Squadron in Egypt, without the usual break from combat duties. On Christmas Eve 1942 he "learned" to fly the Baltimore. This consisted in standing behind the pilot for a circuit, then going off on your own. Make or break! Then he moved, with 203, to Benghazi in Libya, which part of his career can be followed on the next page. He left there in November 1943, and by January 1944 had taken up the offer of a flying instructor course in Southern Rhodesia. Empire boat to Durban, then by train to Norton, where he flew Oxfords, Cornells and Harvards. Cornell (15133 of the Royal Canadian Air Force) at Norton. Note the Tiger Moths in the background. Strange that these three aircraft bear the names of famous universities! After Norton, he again flew by Empire boat from Durban to Cairo, and was posted to 75 Operational Training Unit at Shalufa, Egypt. The good news soon came that he was to go home. He returned to Sydney by slow boat in September 1944, having wondered more than once if he would ever see it again. From there to 7 Operational Training Unit at Tocumwal, New South Wales in December, where he learned to fly Liberators, and later taught others to do so. Formation of Liberators out of Tocumwal. This one is B24L A72-120. "We were on a war bond trip to Sydney, sitting there with a Sydney radio station tuned into the r.d.f (radio direction finder) and the autopilot doing the work. I had a pupil in the left seat getting some hours up." Later in 1945 found Tony at 1 Aircraft Performance Unit Test Pilots' Training Flight at Laverton, Victoria, where he flew the Wirraway and the Mitchell, before a return to Tocumwal. It was at Tocumwal that Tony met Kath, the beautiful driver of the aircrew bus. They fell in love, married and remained happy until Kath's sad departure for, as Tony would say, that Big Airfield In The Sky, more than 60 years later. Tony was discharged on 7 January 1946. "On the way to 244 Sq. at Sharjah we got stuck at Habbaniya about 60 miles west of Baghdad. Communications Flight grabbed me and set me to work flying their antiquated machines. There was one Tiger (Moth). Ronnie Robson, another Oz pilot, and I had been flying Blenheims in Kenya. We'd brush up in the Tiger. Ronnie, a big guy, is flying the airplane. Suddenly it starts to go sideways. He yells for me to take over. I grab the controls, see the stick hard over one way, rudder the other. I centralise and the Tiger resumes a sedate attitude. No way we could sort it out in the air, this one had the old voice-tube communication. By the time we landed we'd both figured it out. The Blenheims needed a bit of push on the controls, the Tiger didn't. Not realising, he'd been trying to fly with them opposed. Before my first flight my instructor told me to handle the stick the same way as I did me when I had a pee. He also said to treat everyone else in the air as a damn fool not about to do the right thing and I might survive." "I flew the Gladiator target-towing at Habbaniya about 60 miles west of Baghdad in 1942. First flight I took it up to 8,000 feet and threw it around for an hour, returning by gently easing the stick back whilst upside down and letting the speed build. It was flying strangely as I landed. I told the riggers. Next day another pilot took the second Glad, did much the same, the wings came off, wrapped themselves round him and the cockpit, he couldn't get out, made a big hole in the desert. No wonder by 1946 I reckoned my luck may have run out and left flying." "On April 7 and 8 1942 I led the first three Blenheim IVs from Habbaniya to Sharjah and, on September 27 in Blenheim Z9739 with 6 others on board, set off for Wadi Shariah in Palestine to collect the first of the Bisleys, returning on October 4. Lost an engine at Bahrain on takeoff just above the palm trees and had a busy few minutes until I could get us all back on the ground. I really found out then how a pilot sweats when one of those fans on the front, meant to keep him cool, stops. No doubt later on 244 pilots cursed me because, according to a post-war 244 Sq. Association Newsletter, after I left on December 16 they had 32 flying crashes in two years." As Tony recounts, 244 was re-equipped with Bristol Bisley (originally called the Blenheim V) aircraft. According to Colin Richardson ("Masirah" 2003), these were "truly dreadful aircraft" and "the loss rate was so high that a total of fifty Bisleys were issued to the squadron in sixteen months". Several crashed in Oman, and at Sharjah. 244 Squadron was re-equipped with Wellingtons in 1944, and the remaining Bisleys were then transferred to a base at Heliopolis, just outside Cairo. "June 1, 1942. In Blen. 4 Z9815 with P.O.Galwey, my crew Sgts. Hampton and Allan, Sharjah to Bahrain 2 hours 20 to search for a crashed Boston. June 2, search of the coast there, 4 hours 30. No result shown. Back to Sharjah. June 3. I don't know if it ever was found. September 17 in Blen. P6931, Sharjah to Dohar to search for Blen. 9708. Recalled before Dohar, aircraft located from Bahrain. Sept.18, Sharjah to Shinas in Z7580 searching for 9718, had engine trouble, returned to Base and on 19 and 20th. further searching. No sign of missing crew or aircraft." "I got this far (Sharjah) via OZ, Egypt, Kenya, Egypt again, Palestine, Syria and Iraq. This far in those days was the arse-end of the world, Sharjah in the UAE. July 1942, temps about 50C, humidity 90. Poor food, short of water, worn-out Blenheims, antiquated Vincents.7000 foot mountains to cross. Fun, fun, fun. 23 flights for the month. Anti sub. patrols carrying depth charges, practice gunnery, Sharjah - Muscat - Ras Al Hadd - Masirah and return several times in Vincent K6359 taking passengers. On the 23rd. in 6359 a change, Sharjah - Jiwani in Baluchistan. The Indian Army detachment at Gawdar had run out of, you guessed it, dried dates. Tubby and crew to the rescue. Gordon, my navigator and a damn good one, woke up in the morning at Jiwani and nearly wet himself. There was a very large bearded Indian beside the bed holding an also very large cut-throat razor at the ready. It took some explaining in broken English before he convinced Gordon he was only there to shave him. July 25. Another trip on which I nearly broke Gordon's ankle. I prided myself on my landings, trying to return to earth as someone put it “as smoothly as a cat peeing on grass." I was well into final approach, not far out when, luckily, I spotted a wire, a radio aerial, strung by some idiot, across the strip, right in front of us. Cursing I hauled back on the controls, hurdled it, should have gone around again, made a snap judgement, put the poor old Blenheim down hard. Not my usual way. Gordon had been sitting with one leg bent under him. For several days he limped, no doubt saying a few words about pilot’s rough landings." "Coming up, taking an appendix case to Bahrain and, at Muscat, Gordon walking through a Vincent's turning propeller ---- Unscathed." "By the end of the war I had the shakes; should have taken the 6 months break at 30 missions I guess. Very lucky so far, newly married to a lovely woman, having missed death by a whisker many times. I decided not to push my good luck any further. We were too poor to sport fly anyway. For adventure Kath and I pioneered, first spearfishing with diving masks bought off the counter at Mena House at the Pyramids in 1943 (how that was going to shape our lives), then when scuba arrived just strapped it on, went in, threw spearguns away, got Nikon u/w cameras and set out to photo it all. More pioneering really. Took us first to holidays on the Reef and then to four years at Heron Island running their dive operation which was how I retired." "A quiet country guy, I felt I could fly anything flyable. I still don't know where that came from. I carried the same attitude into diving. Never been over-confident, always careful, just felt I could do it and went ahead and did it." "If you learned in Tigers you could fly about anything. The South African Air Force switched to Fairchild Cornells (I flew them in what now is Zimbabwe at the RAF instructors’ school at Norton) and found pupils were getting through and killing themselves on more difficult machines. They went back to Tigers." "To me one of flying's grand moments, taking off in drizzle, going onto instruments, breaking out into the sunshine, flying as close to the cloud top as possible. Sensation of speed and fun whipping thru the bits sticking up. Another for me was when all those tonnes of charging, roaring, vibrating metal became light enough for me to, with a slight back-pressure on the controls, lift it gently into flight. There were many more, like when returning to Benghazi on a black night, seven hours out roaming the Aegean, maybe skirting the Turkish coast keeping the regulation 2 miles off, exchanging fire with the German-held ports on the Greek Islands, our two turret guns to their hundred or so (we flew very low) and seeing right in the centre of the screen the searchlight shining on the clouds that the Army put up for us to help us home if Benghazi wasn't being raided. All fun, fun, fun ____ if you lived." "Hey, yesterday the 15th. It was a year since Kath died. I've had an old 35mm negative album here, never opened it. There are hundreds of b & w negs in it back to pre-WW2, many not printed. Something sent me to it. I opened it randomly, pulled out a strip of 6. Kath was on it photoed at Tocumwal where I met her. The next one had me on it too. Coincidence or something else? Neither had ever been printed. Next step, would they be any good? This scanner does slides and negs. Bunged a strip in, bingo 6 positives on the screen. Attached a sample taken about 1945." For pictures from Tony's service with 203 Squadron at Benghazi, Libya, in 1943, where he flew the Baltimore light bomber, click here. 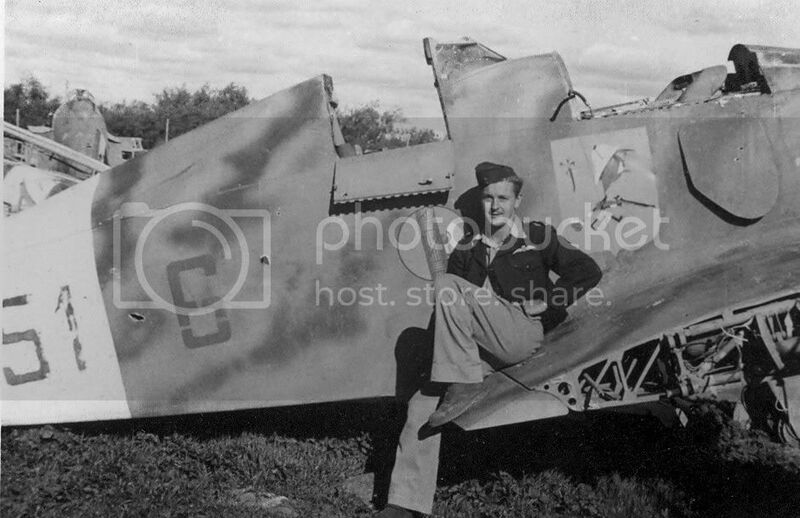 Tony also took a number of photographs of wrecked and abandoned Axis aircraft at Benghazi. See the page on Benghazi graveyard.